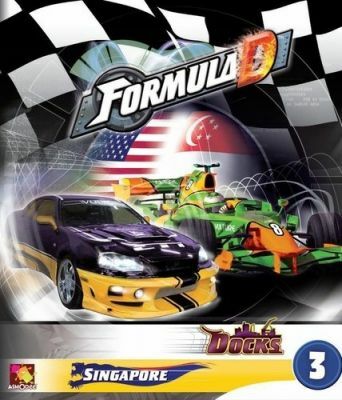 Expansion Tracks for Formula D\n\nFrom the publisher:\n\n1. Singapore -- this track is a one-of-a-kind night-time street race, with a mix of fast turns and slow chicanes that will test your nerve and push your skills to the limit!\n\n2. The Docks -- this fantasy track has 3 routes around which one may race. Each route has its own dangers (this track was the winner of the ASM's track design contest).\n\nFrom the Publisher:\n\nAre you a fan of Formula D? One of the most renown racing games is about to improve again with the addition of two new circuits in the third extension.\n\nDiscover the urban circuit of Singapore by night. It is characterized by tight turns and a new aspect of racing: illumination. A challenge which requires technical virtuosity and maximum adaptability!\n\nThe aficionados of street racing will be able to discover a high-risk track on an industrial dock with first light of dawn. A subtle mixture of improvised obstacles and roads for a mortal playing field!